Massachusetts has all those Cape Cod beaches (including Cape Cod National Seashore), as well as others on the South Shore near Plymouth, the North Shore and Cape Ann, and the islands of Nantucket and Martha's Vineyard. 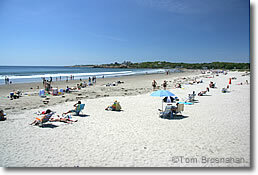 Gloucester is famous for its beaches: Good Harbor Beach, Wingaersheek Beach, Long Beach, and the relatively unknown little crescent beach in Stage Fort Park. on Cape Ann north of Boston.